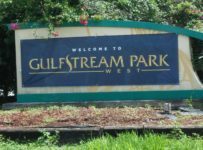 Gulfstream Park West will host a 9 race card today, with 76 scheduled starters. As of 9 a.m., the dirt track is listed as Fast, and the grass is “off-turf”. Races 3,5,7,9 are turf races. We’ll no doubt see a few scratches if the off-turf races go that route. Thursday saw all turf races moved to the main track. Fifty-three starters competed Thursday, over the 8 race card, where just two favorites won, and generally lower odds horses prevailed. The late Pick-4 and Pick-5 paid $219 and $682 respectively, while the Rainbow 6 paid $1,420 on a pool of $22,830. Nine lucky tickets cashed that wager. 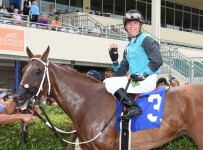 The Rainbow (Pick-6) was hit by a single winner for three consecutive race days before Thursday, so the jackpot did not grow. It stands at $5,475 today.